So this hunt leads us down the path of trying some just ok, soggy soft, Oreo® wanna be cookies. Nothing I personally would waste the calories on unless I was really ,really, really desperate. Enter the Glutino Gluten Free Dream Cookies, Chocolate Vanilla Crème. Finally, a cookie that looked, smelled and tasted like the original full gluten version! Glutino is a brand that I have found I can depend on to produce quality gluten-free items. My daughter gave the cookies rave reviews and was completely satisfied with this gluten-free replacement. For me, the key factors of success were the dark chocolate flavor and crunchiness of the cookie. (Ok, so I had to eat one…or maybe two for the sake of the review). They are closest I have had to the original gluten version I remember dunking in a glass of milk! At $3.99 per package of 22 cookies they are a splurge for me, but a cookie I buy for my daughter to keep her on the gluten-free track. I do however use them crushed in various dessert recipes. Try crushing them and pressing into a chocolate cookie crust for a cheesecake or no-bake pie. Or my personal favorite: crush the cookies, drizzle with fudge, and use it as that sought after middle layer in a homemade ice cream cake. And of course you can always squish them into the top of your brownies before baking or add some to vanilla ice cream for an old fashioned cookies and cream fix! For those dealing with multiple allergies, this product contains soy and eggs. It may contain traces of milk, peanut and tree nuts. Enjoy! 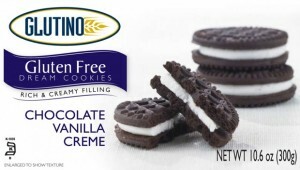 Glutino Gluten Free Dream Cookies, Chocolate Vanilla Crème get 4 ½ SPOONS! Pour a glass of milk and get ready to dunk away!! Michelle is a mother of two from Webster, New York. After years of living with intense gastrointestinal pain, she went gluten-free and has never looked back. Michelle has learned how to cook for her children, who have a laundry list of allergies. She enjoys helping other “gluties” find tasty and reasonably priced gluten free foods that the whole family will enjoy. okay, I know this is a pretty old post but I have to say another really awesome cookie is the Lucy’s Chocolate Chip cookies. I discovered them while I was in my first three months, testing phase, and I ended up buying the store out because they were so good (they only had like 5 small boxes, though :D). I decided that even if I didn’t stay gluten free, I would still buy those cookies. They’re more expensive than the glutino cookies though – somewhere around $5 for a much smaller package. But worth it! My mom has Celiac just as I do and while she was here staying with me as I recovered from surgery she went to my local health food store and saw these. I remembered reading your article Chelle and told her about them, so she bought them VERY skeptical. (she has had bad GF cookie experiences). She’s now a believer. She had to call me to tell me that they tasted just like Oreos to her and she couldn’t wait to buy more. I was diagnosed with celiac all of three days ago, but my husband has been gluten free for a few years. He picked these up just the other day, and I thought they were pretty darned good. The cookie is very crisp and dry, as it should be. This is one of those cases where rice flour didn’t annoy me with its grittiness; it seemed well suited. And the cream is yummy. The kids accept them completely, which pretty much says it all. Well, I am not at this gluten free stage yet. I maybe in the future. I do have friends with gluten intolerance. I have spent a lot of time looking for products to send them and tried some myself. UCK! is the best I can say for most of them. Fortunately, there are a number of sites for celiac sufferers and others that have some tasty and worthwhile cooking options. Thanks, Michelle! We tried some Oreo wannabe cookies a while back that were really bad. I’ll try to find some of these for Andrew. Thanks for sharing your experiences! !